In a small pot, sprinkle one packet of unflavored gelatin over 1/2 the water and let sit for 5 minutes. Then add 1/2 sugar and heat over medium-low heat until sugar and gelatin are completely dissolved. Set aside to cool a bit. Add half of the vodka to the gelatin mix and half the juice from the lemon and lime. Add 8 yellow food coloring drops. Stir well. For easy clean up, place mini pie crusts into a baking dish. Add two tablespoons of yellow shot mixture to each pie crust. Transfer to fridge and let chill until set but still sticky to the touch (about an hour). Repeat the shot mixture with the last half of the ingredients. Color with green food coloring. Pour green layer over yellow layer. Refrigerate for another 3 hours (or overnight) to firm up the shots. When ready to serve, cut pies into quarters, remove from tins, dot each shot with a dollop of whipped cream and any additional garnishes as desired. Serve immediately. Cute and classy, these mini pies pack a boozy punch that's party perfect. The classic jelly shot is nothing more than cheap booze in a paper cup with some flavored gelatin mix. It’s easy to make and easier to eat, which makes them a bit dangerous! As a dude who is no longer in college, I try to avoid making such things for parties. 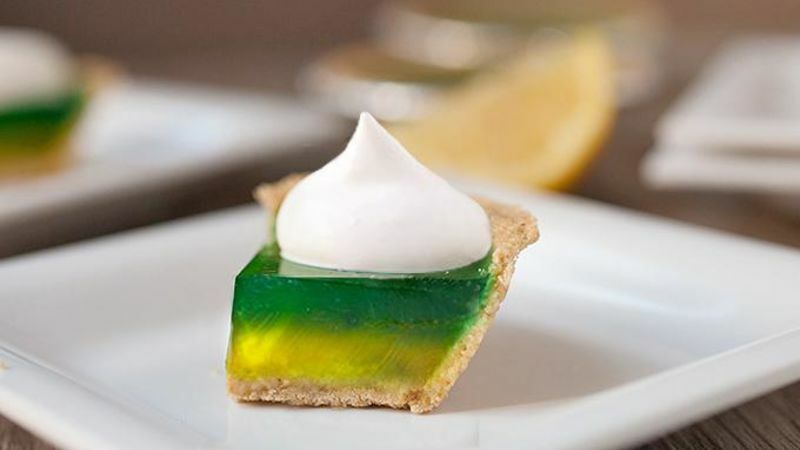 But sometimes it’s fun to serve more upscale jelly shots, like this Lemon-Lime Pie version! To start, sprinkle unflavored gelatin over water and let it sit for a few minutes to soften. If you just stir it in immediately, it’ll clump together and be harder to work with. One key to this recipe is to halve the total ingredients to make two batches of the shot mixture so you can have both a yellow and green layer. To get good layer division, use a full 1/4-ounce packet of gelatin for each layer. Besides the citrus vodka, using fresh citrus juice makes the shots super-flavorful. I did my yellow batch first. For some reason yellow food coloring looks a bit orange sometimes, but trust me. It’s yellow. To make cleanup and transport easier, place your mini pies in a large baking dish. Then add about two tablespoons of the yellow mixture to the pies. Transfer these to the fridge. Be sure to let the yellow layer chill to a soft-set stage (firm, but still sticky to the touch on top) before adding the green layer. If you let it set too long, the layers won't bond – not long enough, and the layers will blend. Then you can make your green mixture and pour that over the top of the yellow layer. Let the mini pies firm up in the fridge for at least two hours, but four hours (or overnight) is best. Then slice the pies into fourths and garnish with some fresh whipped cream and maybe even a sour citrus candy. Nick thinks this recipe is worth a shot (or four)! Check out his blog, Macheesmo, and follow him on his Tablespoon Profile.